Takeaway: As research ramps up on how lighting affects cannabis, many are focusing on how UVB affects the final stages of growth. August Dunning takes us to the molecular level to explain how UVB can affect the strength of weed. Lighting is the means for photonic activation of all photosynthetic plant growth. It’s measured in photosynthetic photon flux density (PPFD). For trichomes, light is one of the three elements—nutrient availability, genetics, and light quality—necessary for the strong synthesis of cannabinolic compounds. For the optimum production in any genetic strain, nutrient availability and light quality can be provided in any number of ways and with various equipment. I prefer growing in sunlight for both the heat provided by the sun through the infrared spectrum, as well as the vast flux density of the other frequencies for strong growth, particularly green light. Green light frequencies can penetrate deeper than red or blue light to increase photosynthesis by exciting chloroplasts located deep in the mesophyll. This is extremely important in the dense canopy production techniques seen during vegetative growth in indoor grows. However, the production of cannabis for medical or recreational use is focused in the final stage: calyx formation to produce the terpenophenolic compounds in trichomes. 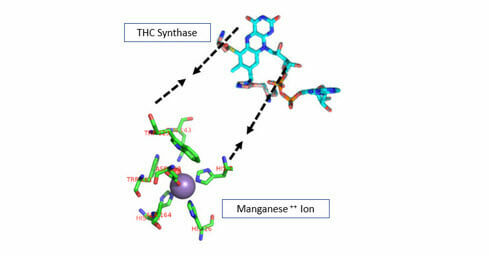 The photomorphogenesis of these compounds are strictly dependent on divalent ions of mineral elements such as ferrous (Fe++) for cannabidiol (CBD) and manganese cation (Mn++) for tetrahydrocannabinol (THC). 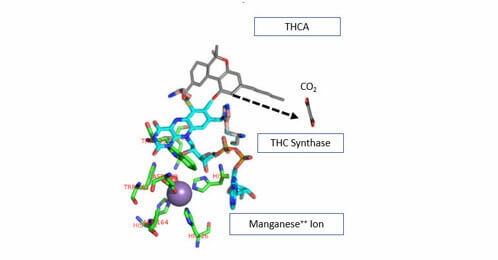 These act as the mineral substrates that deform the synthase molecules that drive the metabolic reactions cannabidiolic acid (CBDA) to CBD and tetrahydrocannabinolic acid (THCA) to THC. These mineral elements, in combination with irradiation by ultraviolet (UV) light, are necessary for the conversion of the acid forms into the active compounds in late-phase, high-PPFD lighting (600-plus nanometers (nm)), though not as currently thought. In this final phase of growth, the ultraviolet B (UVB) input will lead up to the strength of weed. In University of Maryland studies of indoor-grown cannabis, sativa with no UVB compared to plants provided with equatorial sun levels of 385 nm UVB had a 33 percent increase in THC levels. There was no increase in CBD. But 385 nm is not UVB. The UV light used in the university’s testing was at the upper range of UVA, which was why there was no increase in CBD. This is why growers, not lab workers, are better suited to conduct these studies. 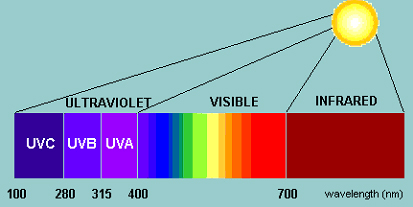 Ultraviolet B has wavelengths measuring 280-315 nm. Some level of photosynthesis occurs in this range and although the high PPFD of this frequency is somewhat damaging to a plant’s photosynthesis process, this is not the objective. Protein activation is the objective, and the cannabis plant is protected by a protein called UVR8 in the disc cells of the trichome. This protein is a dimer protein, meaning that it is a combination of two mirror-image structural proteins. A key region of the UVR8 dimer structure is the interface where the two monomers are in contact. This interface is rich in aromatic and charged amino acids that are crucial for both the structure and photoreceptor function of UVR8. When irradiated with UVB, it splits apart and is attracted to the gene plastids in the leucoplasts of the glandular trichomes to stimulate cannabis’s production of chemicals via the MEP pathway for terpene synthesis and the polyketide pathway, specifically malonyl-CoA. Why is this important? Because cannabis uses the MEP pathway for the synthesis of geranyl diphosphate (GPP) and malonyl-CoA in the polyketide pathway to make olivetolic acid (OLA). This reaction is catalyzed by a recently discovered polyketide synthase (PKS) enzyme and an olivetolic acid cyclase (OAC). The geranylpyrophosphate-olivetolate geranyltransferase catalyzes the alkylation of OLA with GPP leading to the formation of CBGA, the central precursor of various cannabinoids. Many growers believe it is the UVB hitting the cannabinolic compounds in the trichome secretory reservoir that cause the acid conversion, but, in reality, UVB is the genetic activating frequency of light that stimulates the production of these compounds in the colorless, non-photosynthesis leucoplasts of the disc cells to create the chemistry for later enzymatic conversion of acid forms into active forms. The secretory cavity may play a role where it may act as a lens directing UVB to the disc cells at the base of the trichome reservoir to focus the light to where the UVR8 photoactivation takes place. The disc cell ring is where the terpenoids are created and combined with the cannabinoids created from the alkylation of OLA and GPP and found thereafter in the secretory chamber to undergo metabolic conversion by the action of the synthase molecules and micronutrient ions provided by foliar spray or root treatment. This is seen as the secretory chamber turning from clear to cloudy. It’s in the trichome head where the micronutrient substrate ions attract the synthase molecules to deform them so that they can convert the acid forms. This interaction transfers electron charge potential to defeat the carbon dioxide molecular bond on the THCA or CBDA to elevate the bond energy to break the bond and release the carbon dioxide to complete the process of converting acids to active compounds. Sunlight provides this, but weather variability can affect the final product. Indoor growing is a more reliable way to provide the optimal UVB during growth if the lighting is correct. Ultraviolet B is already generated by the mercury found in all high-intensity discharge (HID) light sources, but it’s typically blocked by the bulb’s outer glass jacket. Richard Feynman utilized this knowledge to observe the first atomic bomb test, the Trinity Test, carried out inside a car, without protective goggles, using the glass windshield to protect his retinas from the UVB in the initial flash of the explosion. Ordinary glass blocks more than 90 percent of UVB radiation, so UVB levels will naturally be a little higher using open fixtures without a glass lens, but the bulbs still have glass jackets. There are lighting systems that are designed to generate ultraviolet in the UVB range. The absence of UVB does not eliminate THC production, but rather reduces the output. It does, however, limit or stop CBD production as seen in the tests at the University of Maryland from the use of the incorrect UV frequency in their tests. I used to use a UVB fluorescent tube from a tanning bed during my guerilla growing days in the dark ages of prohibition, but now better lights are on the market. Recently, several LED light companies have approached this issue to create lighting for indoor growing that mimics the solar UVB output and can help produce strong resin production for indoor hydroponic growing. If you want stronger weed with the maximum potential for the strain you are growing, get UVB in your growroom during flowering and late phase trichome production. Keep in mind, however, your eyes and skin can be damaged if exposed to UVB. Use caution when using secondary UVB supplementation by using glass eyewear, not plastic or polycarbonate.